Dolphins can swim at a speed of up to 25 miles (40,2 km) per hour for a long time. This is about 3 times faster than the fastest humans in the world. The average lifespan of a dolphin is 17 years. However, some of them that have been observed in the wild have lived about 50 years. Dolphin is the only mammal that gives birth with the tail first instead of the head. Young dolphins will remain with their mother for 2 to 3 years. Young dolphins are called calves, female adults are cows and male adults are bulls. Dolphins have a poor sense of smell. Dolphins have two stomachs, just like cows. The first one stores the food and the second one is where digestion takes place. Each dolphin’s dorsal fin is unique and can be used to identify them from each other. Most species of dolphins live in saltwater but some of them thrive in freshwater. All dolphins have a blowhole at the top where they take in air when they come to the surface. A dolphin needs to get air at different intervals. Some need air in less than a minute and others only need it every 30 minutes. 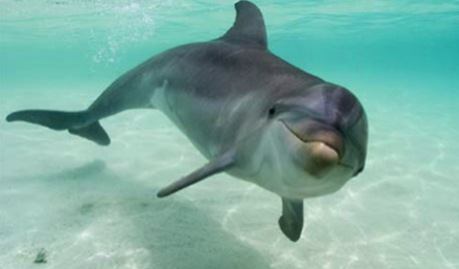 The brain of a dolphin is number 2 in terms of size compared to its body size. Only the human brain is bigger. Only one side of the dolphin’s brain sleeps at a time. This allows them to be able to breathe and to be able to watch for threats even while they are resting. A group of dolphins is called a pod or a school. The bonds of dolphins in a pod are very intense. They have been seen caring for the sick, the elderly, and those that have been injured with great care. Even though they are usually very mild tempered and friendly, dolphins can be aggressive when threatened or provoked by humans. Dolphins are able to see well in the water due to the retina gathering light in a unique way. A mature dolphin can eat up to 30 pounds (13.6 kg) of fish daily. A dolphin can leap up to 20 feet (6.1 m) in the air. The Killer Whale is the largest member of the dolphin family, and can be up to 30 feet (9.1m) in length. The Boto is the largest of the dolphins that can live in freshwater. They can be up to 10 feet (3m) long. Dolphins often use a hunting tactic of circling the fish in a school so that they make a tight ball. Then they will take turns going through the centre of the ball to feed as they do so. Dolphins enjoy socializing and playing. They play with seaweed or with other members of the pod. Sometimes, they will tease other living creatures in the water. The name dolphin comes from the word womb, and it is believed to be the Greek saying for “a fish with a womb”. The fluke is the name for the tail on a dolphin. Echolocation is a big part of overall communication for dolphins. It occurs through the melon in the head. Almost all dolphins have no hair other than a few that they have at birth. Only the Boto River Dolphin has a small amount of hair that they will keep as an adult. Dolphins have a fast healing process for their bodies even when they have deep wounds such as those that are the result of shark bites. Experts haven’t been able to determine how this is possible for dolphins when other mammals would haemorrhage.